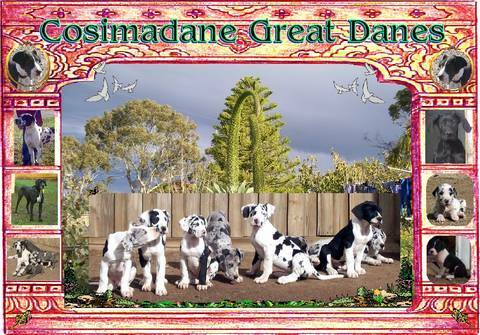 By doing this we are ensuring that we breed Great Danes that will be of good bone structure, conformation, temperment and colour. Only approved show or breed homes will have pups placed on main V.C.A. registration. All pups will have been vaccinated, wormed, vet checked, microchipped, and will be registered with the VCA. We hope you enjoy your visit. Feel free to have a look around and contact us if you would like to know more about our Danes!